This elegant indigenous flower has a unique charm. Found virtually throughout South Africa, these flowers can be either evergreen or deciduous. In winter rainfall regions, they lie dormant during the rain-poor summer months, while they rest during the winter months in summer rainfall regions. Kept constantly watered, they’re evergreen. This versatile, hardy plant quite happily copes with salty spray in coastal conditions, and is equally content at higher altitudes with cold winters and a misty mountain environment. Arums also comfortably cope with mild frost. Although also commonly known as ‘calla lilies’ elsewhere in the world, arums are not members of the lily family. The white spathe is, however, associated with the purity of lilies, so it’s no surprise that this old-time bloom has graced many a bridal bouquet. Arums grow well in full sun near water, but prefer a semi-shaded environment when there’s no permanent water nearby. The plant won’t flower much in full shade, but its glossy green foliage – sometimes speckled with white – still provides a beautiful show below trees. The plants flower at their best between August and January, and you should plant them in rich, well-drained soil near a water feature for a really beautiful show. Growing arums is easy, as is separating and multiplying them. Divide the rhizomes when the plant is dormant and replant them at a depth of 5cm. During the growth season you can split the plant with a spade; it also grows from seeds, which should be sown in the spring. Arums are excellent cut flowers that last for ages in water. But do remember that this is a protected plant, so you can’t simply collect armfuls by the roadside or in the veld. If they’re growing on a farm, you’ll need the owner’s permission to pick any. 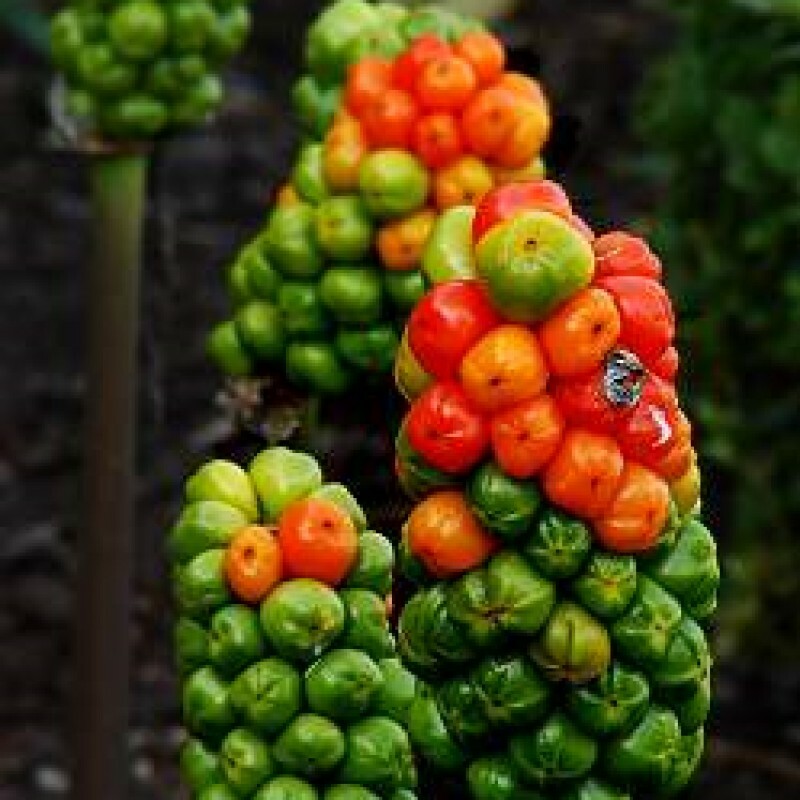 The large (usually white) trumpet that we know as the ‘flower’ of an arum lily is, in fact, a bract that protects the golden-yellow spadix bearing the actual flowers (male on top, female below). It’s reported that former Governor of the Cape Simon van der Stel sent arums to Europe as a curiosity. But it turned out that the flower was already known on the continent, with a 1664 illustration of the royal gardens in Paris including an arum.